In the Sunday school classes at many Unitarian Universalist congregations, our children learn to say: "We are Unitarian Universalists. We are a people of faith who have open minds, loving hearts, and helping hands." We also teach them that Unitarian Universalists aren’t the only wise people, nor the only open-minded or compassionate people. Hindus and Christians and Moslems and Buddhists can show us some ways to be better Unitarian Universalists. One of those people of deep faith who have much to teach us to deepen our faith was Mohandas K. Gandhi. Let me first ask: What do you want? Did you ever think you wanted something, and then found out that it wasn’t what you really wanted? What we think we want isn't always what we really want -- and we often don't know what we really want. I think that happened to Gandhi. 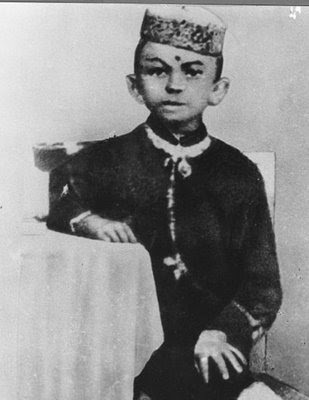 Gandhi was born in India in 1869. He became a lawyer. At first, he couldn’t make a living as a lawyer because he was too shy to speak up in court. What did Gandhi want? One thing it seems he wanted was for other people not to think badly of him. That made him shy about speaking up. But what did he really want? He didn’t know yet. He moved to South Africa to do lawyering paperwork for a company there. Gandhi was in South Africa for 21 years. He gradually came to see that what he really wanted – what his heart wanted – was peace and fairness for all people. His heart knew that the suffering of others was his own suffering. Knowing this helped him be less shy. Once, he was thrown off a train because he was in First Class, and the train official said his skin wasn’t pale enough for him to ride in First Class. On a stagecoach, he was beaten by the driver for refusing to make room for a European passenger. What did Gandhi want? He wanted to be treated fairly. As he thought about his own desire to be treated fairly, he began to see that there was something bigger that he really wanted: fair treatment for all people. 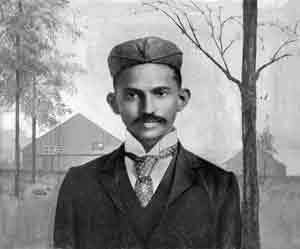 Gandhi began organizing protest against a law that said Indians in South Africa could not vote. He was attacked by a mob and barely escaped with his life. Later, he could have asked the police to arrest the people that attacked him, but he wouldn’t do that. He said he wouldn’t use the law to fight back against personal wrongs. What did he want? He wanted laws changed to be more fair. More than that, he wanted hearts changed. He wanted to see meanness learn how to turn into love. He knew putting people in jail wouldn’t help them learn how to be kind. When he finally returned to India, it was ruled over by the English, and the English didn’t treat the Indians very well. Gandhi organized India – millions of people – to protest to let India be governed by a government elected by all of India – instead of being governed by another country. Gandhi knew what the Indians wanted – and he knew what the British wanted, too – what they really wanted in their hearts, even if their thinking heads hadn’t figured out yet what the hearts really wanted. So Gandhi always led protests that were nonviolent. People can’t open up to what their hearts are telling them if someone is hitting them. Through Gandhi’s nonviolent leadership, the British as well as the Indians were shone the way to greater flourishing and happiness. Part 2 of "The Spiritual Activist"
Next: Part 3: "Dorothy Day"
Previous: Part 1: "Satyana's Principles of Spiritual Activism"